I went to Thrive City Church in Hamilton a couple of weeks ago, The pastor Steve Jeffares was talking from the Parable of the Mustard Seed. He talked about the way we as christians often tend to look at the seed God has given us. We look at the seed and compare it to others, "so and so has this great calling on his/her life, all I know how to do is cook and clean". It is easy to look at a seed and see it as insignificant. Have you ever held a seed in your hand? Doesn't it look so small and vulnerable? But even a small seed (as in the case of a mustard seed) can grow into a tree big enough for birds to perch on. We shouldn't look on what God has given us as a insignificant job or talent. We should treasure it as a seed from God, water it, give it sunlight, and plant it in good soil. We shouldn't look at what the seed looks like, instead we should look at how we are growing it. I was think about seeds and this though came to mind, seeds don't turn into trees, carrots or whatever overnight. Each seed has to complete a long journey in becoming what they should be. Some seeds actually need to be near a forest fire or choked in smoke before they will start to grow. As a seed is growing it must withstand storms and frosts, fires and downpours, few seeds have an easy journey. It is like that in life we all have to weather the storms of life + stay strong, stay on the journey that has been laid out before us. I talked to a girl at church today who is looking for a job that uses the skills she learned in her studies. She said, "I really felt like God led me to study what I did, It is my passion, yet I can't seem to find a job that uses it. I'm starting to feel like all that study might have been a waste of time." (not an exact quote but close enough :) What came to mind? A Seed and Journey. Journey's aren't easy or short, if they were they won't deserve the name. Completing a journey is a great accomplishment. Of course it is hard, of course you will wonder if you have it all wrong, but stick in there, finish the race, finish the journey. Jesus used the analogy of plants/seed quite a lot during his time on earth, why do you think that is? Can you think of other examples in the bible of people being compared to plants, trees, or seeds? Awesome to see a post from you I can comment on =). I think the first thing we have problems with is knowing what a seed looks like. 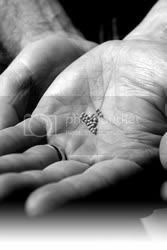 If we have a handful of sand and place a few mustard seeds amongst it will we be able to recognise the seeds? Are we better to place the whole handful in the ground and water and feed and nurture it and see what appears, or do we spend an age trying to identify the seeds and then plant them one at a time and wait and see what each one will do? Not all seeds produce plants - some naturally die, others die regardless of what we do during their growing years, so do we need to plant and nurture one seed or many? Is there danger in focusing only on one area? You are completely right - it does take the death of the seed and often the apparent damaging of the seed in order for a dream to grow and often that seems completely wrong in our eyes. If we continue to nurture what remains of the seed however then we see amazing things begin to grow. Also out of the death of a plant many new plants are brought into being and nurtured and sometimes the best thing for the forest is for one tree to be sacrificed, letting in light for others to grow. It's, as you said, ultimately about the journey. We start off with small beginnings, seeds in our hands, and we begin to move in faith. Yes occasionally we make wrong turns, nurture the 'wrong' seeds, but God will always steer us back on the path and those experiences become fertiliser for new seeds. I studied psychology for 4 1/2 years and now know that I will never be an Applied Behaviour Analyst as I intended. However that knowledge and the dream that was are bringing levening to my new dream of becoming a Pastor and enabling me in this part of the journey. I think I'll stop here cos yet again its become an essay but thanks heaps for your post - as is obvious it's certainly had me thinking ('out loud' so to speak) and for me that's the best sign. Anything that leaves me pondering beyond the actual experience in the moment has added to my life in some way so thanks! Keep blogging!!! Great thoughts about seeds... interesting how the outer layer on the seed needs to be 'worn away' (for it to be activated) and how this can take even years! In our instant society I don't think we connect with the seed analogy too well... it just plain takes too much time! Great thoughts from both of you. Clive, I think you are right about our culture not relating well to the analogy of seeds, we almost have to have is explained to us to understand. To people of Jesus day, the idea of planting seeds or watching them grow would be much more familiar. I've been thinking a little more about bad seed, I heard a message by Joshua Harris where he said we look at sin like specks of dirt, we think we can just brush them off at the end of the day. But really each time we sin we are planting a seed. That's awesome. I've never heard the seed analogy taken further - to the point where hard times - "smoke" actually help the seed grow.